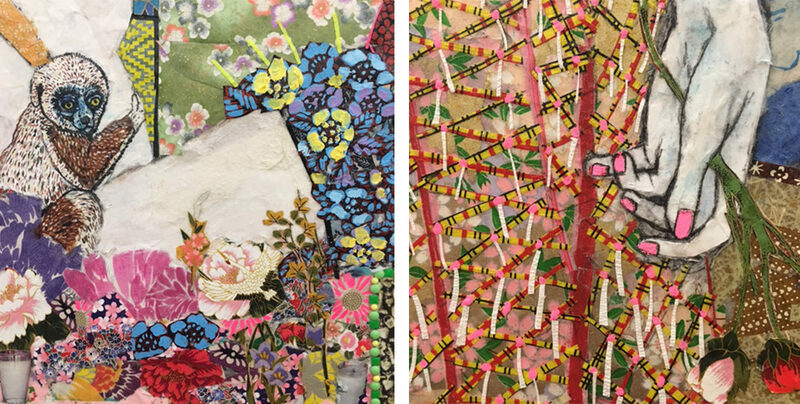 Maria Berrio makes large format collages, composed of tiny pieces of Japanese wrapping paper. They are stunning. Friday night in Dumbo, we decide to dash through the open studios of Sharpe-Walentas Studio Program, it’s the opening night. Enter Mario Berrio’s space, there is no window, and no view of the river and Brooklyn Bridge, at least I don’t remember them. The walls are filled with very large complex collages composed of very tiny pieces of paper. The colors and the detail are intense and captivating. The Colombian-born artist’s works created during 2016 residency use dioramas from the Museum of Natural History as a visual framework, into which Maria introduces elements from her life, imagination, and heritage. Animals, flowers, intricately patterned textiles, magical landscapes are layered with immense care. Maria is peacefully buoyant in her fauna and flora filled mythological collage world, and she graciously welcomes us in. I will stay for a while.